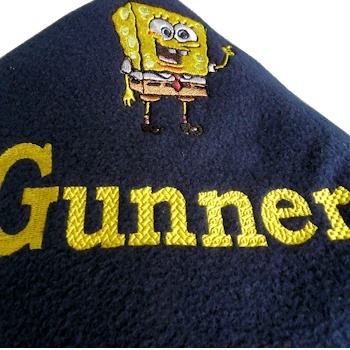 Personalised sensory blanket made from quality polar fleece available in a range of colours. Personalised sensory blanket made from quality polar fleece available in a range of colours. The blanket will be personalised using textured embroidery where the pattern used to fill each letter is different to allow partially sighted or blind to easily follow their name by fingertip and feel the different textured stitching on each letter. The letters will be embroidered as boldly as possible within the space available, each letter with a different stitch pattern so it creates a different touch texture. The blanket can be made to a range of sizes to suit most needs from a baby size, a kids size to a full adults double bed size. There is a choice of thread colours for the embroidered text along with a wide range of motifs available. Please choose from the options; The blanket colour, the size of blanket, if you want to add a motif, the lettering font style, the thread colour for the text and enter the name or initials you would like. Personalised gifts are custom made to order in the UK by Amys Gifts. Please allow approx. 2-3 days for dispatch. We are happy to advise if you have any special requirements, please use the contact us link to the left of our website.